The "Small Crater" is the smallest among the 3 major geologic depression forms known as "craters" (Makhtesh) in the Negev desert. 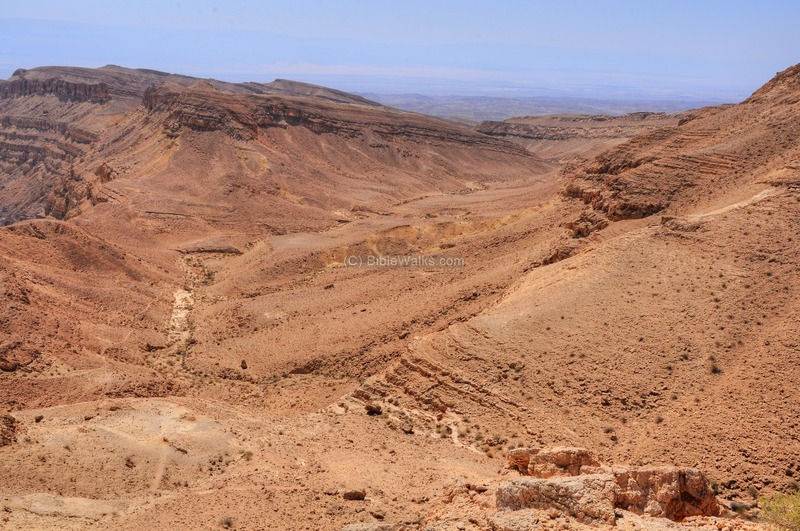 The Makhtesh Ha-Katan ("The Small Crater") is the smallest among the 3 major geologic depression forms known as Makhteshim (geological erosion cirques) in the Negev desert. It is a closed valley with steep mountains enclosing it from all side, with an outlet on the east side. 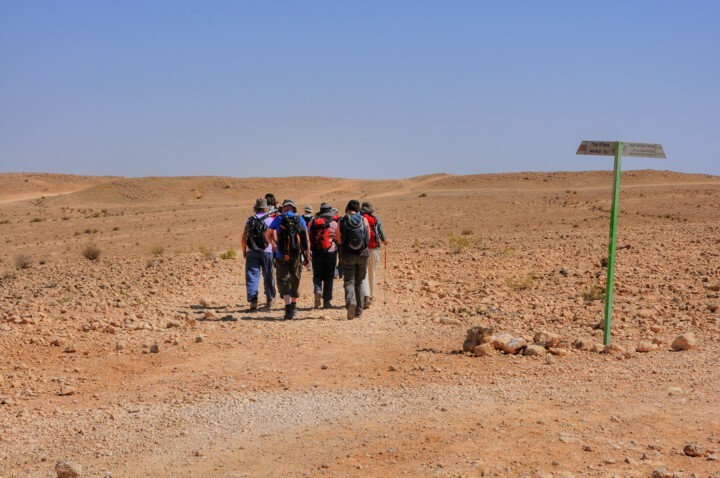 This is a unique geological form which can be found only in the Negev and the Sinai desert, and so the term "Makhtesh" was adopted as a geological term. The makhtesh was created by a natural geological process of erosion, unlike similar forms created by meteorites or volcanic activity. This process started 5 million years ago and ended about 8,000 years ago. The dry climate preserved the unique formation. The common features of the Negev makhtesh are: a wide depression, surrounded by tall cliffs, with sharp rims, and a single outlet located on the south-east side. The other major craters of the Negev are Ramon crater and the "Great crater". Two smaller Makhteshim are on Mt. Arif, south of Makhtesh Ramon. The site is located to the south of the Beersheba-Dimona-Sodom road. Makhtesh Katan is 7km long and 4 km wide. The lowest point of the crater (on the east side) is 13m below sea level, while the lookout point (marked by a yellow square on its south-west rim) is 480m above sea level. You can reach the lookout point by walking about 2KM from the parking place, which is accessible by passenger cars from the road #227 leading to Ma'ale Akrabim (Scorpion Ascent). The Negev geological early history is summarized in the following table. 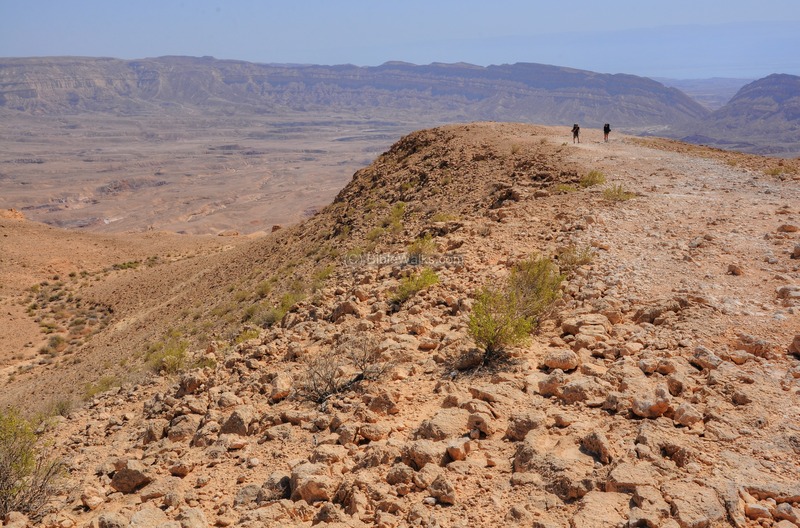 It shows the various periods of the geological processes that created the Negev landscape before the Makhtesh was created. This table shows the events related to the makhtesh, due to the sinking of the Arava (Arabah) along the Syrian-African depression. 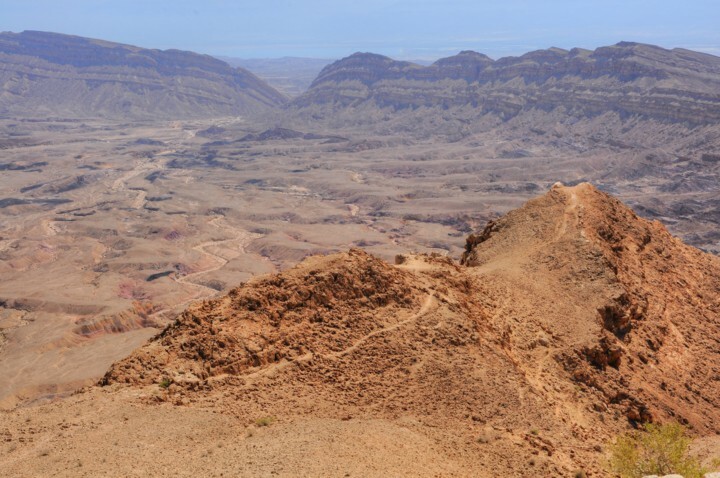 The Arava (Arabah) Rift valley, located just a few KM east of the crater, was formed starting at about 25 million years ago. It is 350m below sea level - a fault which is the lowest place in the World. This depression started the process of sucking out the soft rock under the surface of the Makhtesh, hallowing it out. The bottom of the area sank down, while the solid rocks around it remained at the same level, thus creating a round depression. This process of erosion continued until a crater was formed. Over the millions of years the height difference between the bottom and the cliffs around the crater reached 400-500m. Since the area is dry and inhabited, the state of the small crater remained as it was thousands of years ago. We can see along the steep walls of the rim (here, on the north side) the various geological layers, starting from 190 millions years ago (when the ancient sea covered the area), through the different geological phases listed in the tables above. There are no Biblical sites inside the erosion cirque. Ancient routes do not pass thru the depression, as the hills around it make the passage quite difficult. Mining: In 1959 there were futile attempts to find oil inside the depression. During years 1967-1992 a mining company extracted 15 Million tons of phosphates (salt of phosphoric acid) used as fertilizer in agriculture. Nature: Today this nature site is open to the public. The popular hiking places are the two observation points on the south west side which can be reached from the Ma'ale Akrabbim road. 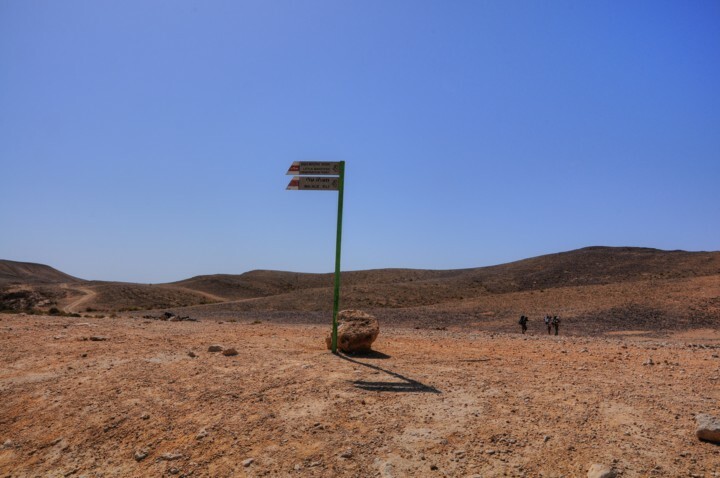 From the parking place is a half hour walk to the observation point of the Makhtesh Katan (the upper sign in the photo below) or to Ma'ale 'Eli (the lower sign, meaning: the "Pestle Ascent"). After the walk, you reach a junction where you either take the right side to the observation point, or straight on the Ma'ale 'Eli. The latter name - 'Eli meaning: "Pestle" - is a grinding tool which is used within a mortar (Hebrew: Makhtesh) for crushing and mixing substances. The mortar resembles the shape of the crater and the place where the pestle is supported by the rim, as shown in the illustration on the right. If you select to turn right to the observation point, a short walk will get you there. 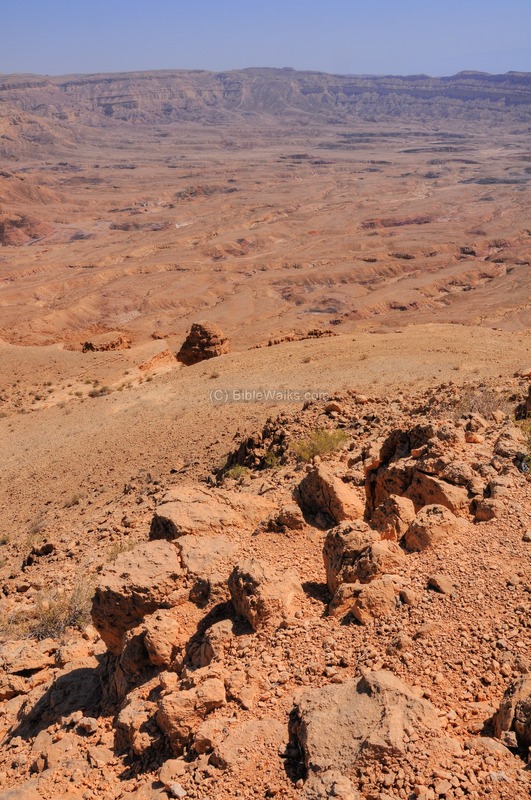 The observation point is seen in the next picture, with the depression of the Makhtesh behind it. This place is located on the southwest side of the rim of the crater. This picture is a view from the edge of the observation point. In the background is the south-east outlet of the crater. Behind it, in the far background, is the Dead Sea. The observation point is about 450m above the floor of the erosion cirque. A Panoramic view from the observation point is shown below. If you press on the picture below, a panoramic viewer will pop up. Using this flash-based panoramic viewer, you can move around left and right, zooming in and out, and view the site in full screen mode. The viewer automatically rotates slowly around. Due to its large size, it may take minutes to upload... but its worth the view! A view towards the south side of the crater is shown below, as viewed from the observation point. This dry stream bypasses the Makhtesh from the south and is not part of the erosion cirque. A group of Griffon vultures (Gypus Fulvus) soared above, looking for prey. You can see on the upper wing of this bird the number "X24", written on a tag which identifies the bird. Sadly, only a few dozens of vultures remain in the Negev area - due to the dry conditions, hunting, activity of jet fighters, electrocution on electrical posts and poisoning. 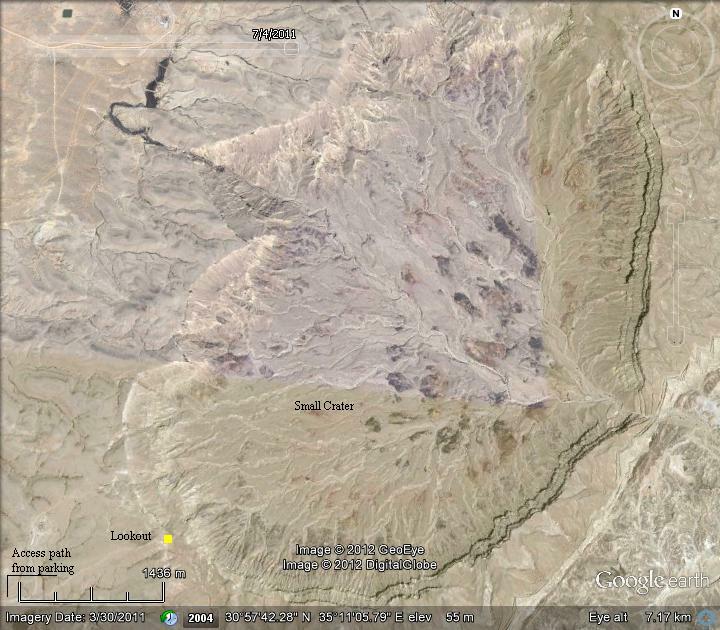 Makhtesh - Hebrew: crater, or in geological terms an erosion cirque. It is a biblical term for a hollow place, referred in Samson's life as a valley enclosed by hills (Joshua 15, 19): "But God clave an hollow place that was in the jaw, and there came water thereout; and when he had drunk, his spirit came again, and he revived: wherefore he called the name thereof Enhakkore, which is in Lehi unto this day". Makhtesh, Maktesh - one of the many names of the city of David in Jerusalem, which was within the valley of Kidron enclosed by hills (Zephania 1, 11): "Howl, ye inhabitants of Maktesh, for all the merchant people are cut down; all they that bear silver are cut off". Wadi Hatzira - name in Arabic.